Bear Creek Rehabilitation | David Evans and Associates, Inc. The Bear Creek Rehabilitation Project won ACEC Washington’s 2015 Gold Award in the category of Future Value to the Engineering Profession. 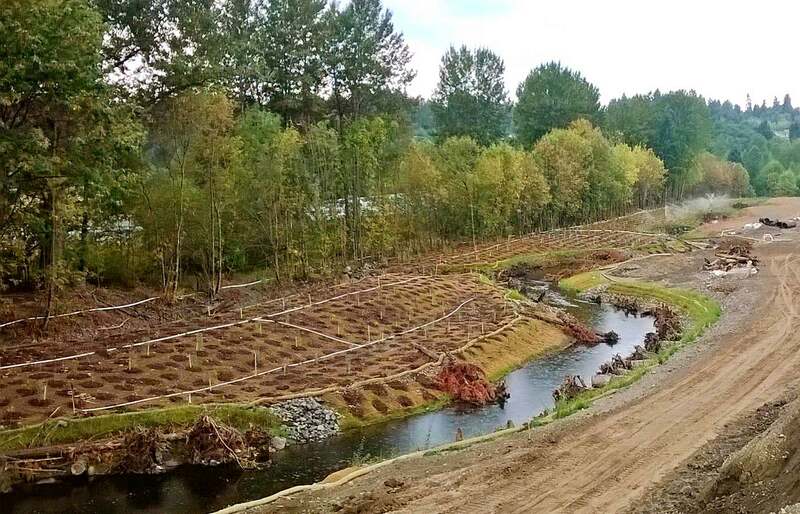 DEA provided stream restoration design and permitting to create a more naturally functioning system along Bear Creek in Redmond, Washington. Lower Bear Creek had been straightened and hardened by the U.S. Army Corps of Engineers in 1965 and was identified as a high-priority for restoration, because it is a critical migration route for diminishing wild salmon stocks from the Lake Washington system. DEA’s design featured fish passage channel restoration, streambank stabilization, wetland mitigation, and floodplain storage volume for FEMA “zero rise” requirements and cultural resources preservation. DEA’s design realigned 3,246 feet of channel and increased the overall project in-stream habitat by approximately 1,335 feet. 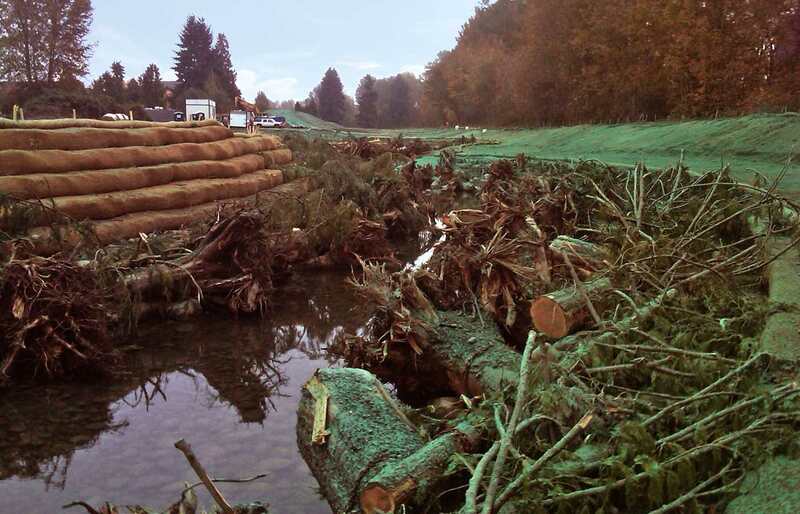 Approximately 1,500 pieces of large woody debris (LWD) were installed for pool formation and bank protection. More than 3,000 feet of trail was realigned away from the stream, with controlled access offered at pedestrian overlooks. 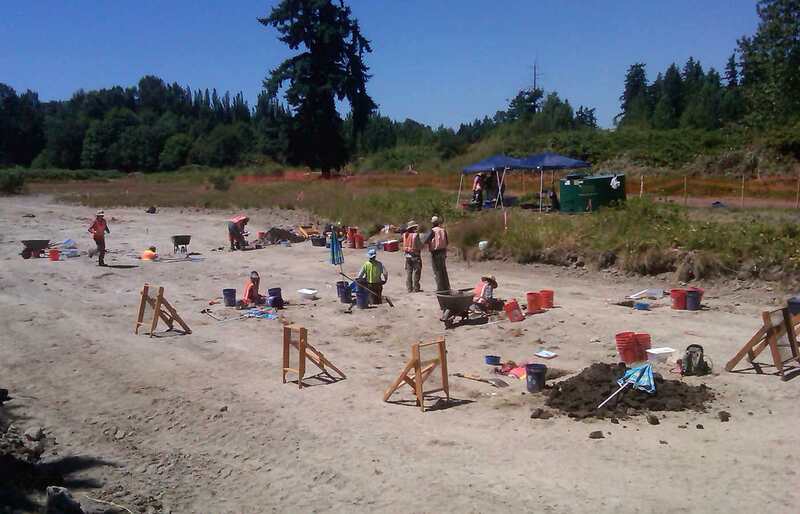 As part of the Clean Water Act Section 404 permitting evaluation for cultural resources on the site, artifacts were found dating to the end of the Ice Age up to 12,000 years ago. This discovery delayed design, permitting, and construction until the site could be evaluated. It also required innovative design and engineering solutions to mitigate impacts to cultural resources in order to successfully permit and construct the project. 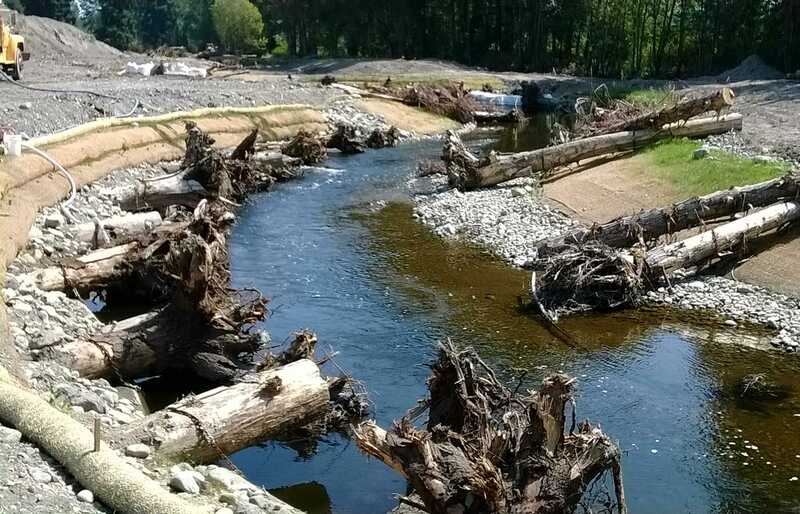 DEA worked with the City of Redmond, and state and federal agency stakeholders including Native American tribes, to avoid and minimize impacts to the cultural resources by realigning the stream and designing LWD bank protection to prevent channel migration into the resource area. The work was phased over three separate construction packages in three years to accommodate cultural resource field investigation and artifact recovery while moving forward with the restoration design to meet funding and permit requirements.